For reasons complicated enough to deserve their own column — or more like a graduate-level dissertation — an athlete behaving badly on his personal time is 100 times more likely to grab the media’s attention than an athlete who does good deeds. Nail Yakupov‘s nascent National Hockey League career has not seen him make headlines for getting in trouble. So far, the third-year winger’s worst crime has been not living up to the expectations that come with being the No. 1 overall pick in the NHL Draft — which Yakupov was in 2012 when the Edmonton Oilers made him the first Muslim hockey player to receive that honor. Since then, Yakupov has netted 40 goals and 45 assists in 189 NHL games through Sunday’s schedule. He hasn’t been bad, but he hasn’t been as good as the Oilers had hoped when they chose him to be a cornerstone of the franchise’s massive rebuilding project. Recently, however, Yakupov surely gained some new fans when the media actual devoted some real estate to a story about the 21-year-old Russian going above and beyond what many people would do in the name of charity. Yakupov, in a chance meeting outside a downtown hotel Sunday, bought the man dinner and paid for a hotel room for the night. The feel good story caught fire on social media, but to Yakupov it was no big deal, just the kind of gesture the 21-year-old winger makes on an almost daily basis as he tries to help out people who need a break. “Nothing (bad) can happen if I give some money or buy something for people who can’t buy anything at that time,” he said after practice Tuesday. “I think it’s important. I just try and help people out. Normally Yakupov approaches the person in need, but Sunday’s meeting was kind of the other way around. Normally when a homeless guy knocks on your window you lock the door and speed away, but Yakupov stopped and listened to what the man had to say. He wanted a coffee. 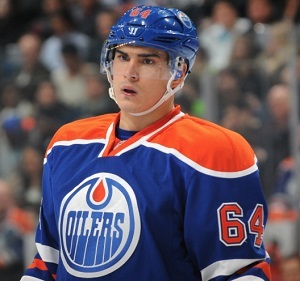 When Yakupov pressed for more information, he discovered that yes, the man was hungry, too. So he took him inside the hotel restaurant, told security he was his guest, let him to order whatever he wanted, paid the bill and left. “I thought they’d kick him out because he had dirty hands. So the first thing I told him was go wash your hands and I told security don’t kick him out, it will be fine. The homeless man, who didn’t know Yakupov was a hockey player, asked if by chance he could spare money for a room. Yakupov gave him the last $35 he had on him. “People told me he actually went to a hotel and stayed there for one night, had a shower,” said Yakupov, who likes to make sure the money is being used the right way. Most of his charitable endeavours are quick hits like stopping on the street to help out a homeless kid or handing a bill to one of those people who camp out on a meridian at red lights. While a lot of people would be stunned and surprised to read about a man who reportedly makes $3.8 million a year in salary — not to mention an athlete, a profession often stereotyped as full of arrogant and self-centered individuals — performing such acts regularly, Yakupov is simply doing what every Muslim is taught to do. The third pillar of Islam is charity. The annual zakat donation is mandatory upon every Muslim who can afford to give, and should be given to those who are living in poverty or who are experiencing financial difficulty. By supporting those in need, a Muslim is not only helping someone else, they are showing their gratitude to Allah (swt) for blessing them with the wealth and resources they do have. Muslims are also encouraged to give sadaqah, i.e. voluntary charity that is separate from zakat. And when you give to others, Allah (swt) will give to you.